I had a me-time kind of morning. I headed out for some inspiration and a quick stop at Paper Source and I obviously didn't walk out empty handed. I got some paper in some very yummy colors for upcoming projects. It may not seem like it but I've been very busy behind the scenes. My blogging may suffer for the next couple of weeks—we'll see. All I had was my iPhone with me so excuse the grainy photo and I'm sorry if seeing my book is getting old, but I still feel excited about seeing it out in the world. I would like lots of paper from every color on that back wall please. 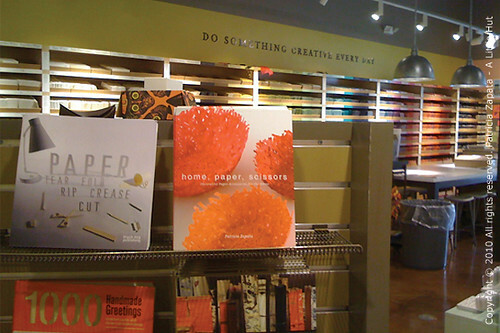 I like what sign says too - "Do something creative every day." Houston museums - They are all fantastic. But one that holds a special place in my heart is The Menil Collection. I made many trips there for class assignments when I was in college. Pinterest - I joined recently and I'm in heaven. I no longer need a folder on my computer to store all the photos that interest me. I can classify them into different boards, have access to them from any computer and I can share with other members too. Dwell magazine - This is the only magazine I get in the mail (part of my 'live simpler' plan). The shapes in architecture, furniture and product design are always so thought provoking. The clean lines and styling are very appealing to me too. I get so excited when I see it in our mail box. InsideOut - This is an Australian magazine I go on the hunt for. My local bookstore carries it at odd times but once I find it, it's SO worth it. I have every issue published since I discovered it last year and I've gone over every copy many times. There is always something new to look at. The InsideOut blog is also worth visiting. Produce section in the grocery store - There really is nothing quite like Mother Nature's combination of color & textures. I'm using this particular inspiration source for some new projects. Where do you get inspired? Anyone care to share?